Did you know there’s a 30 Rock web series called The Jack Donaghy Files? (Or maybe it's called Jack Donaghy: Executive Superhero? Picking a name and sticking to it would be a good first step in building an audience for your web tie-in series, NBC.) 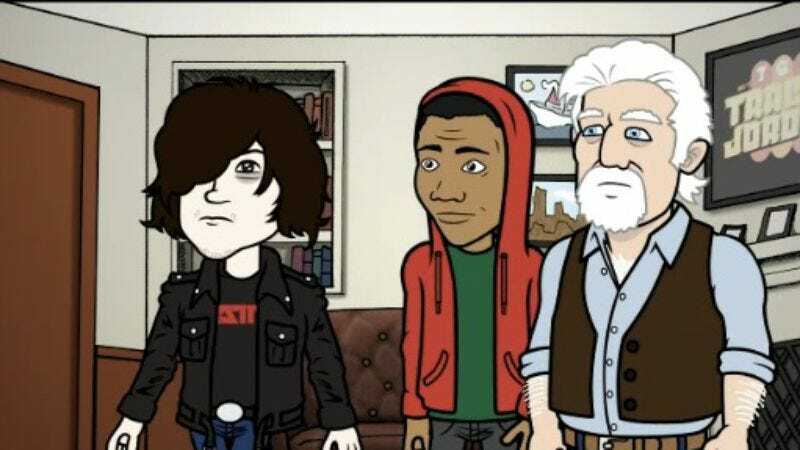 Neither did we, but a surefire way to draw our attention to your web-based supplementary cartoon series is to feature Michael McDonald, Ryan Adams, and GJI-catnip Childish Gambino doing their own versions of classic NBC themes. Well played, NBC. The short centers on Alec Baldwin’s Jack Donaghy finding last-minute fill-ins for Madonna’s Super Bowl halftime show, and pokes the usual 30 Rock-mandated fun at NBC Universal, which is all well and good, but let’s get real: We’re in this for McDonald singing the Saved By The Bell theme song.